The Seeker should be with single-minded Yaqeen and in the Demand for Lord, his heart should set forward, never backwards. Such Seeker gets the Wisaal of his Lord at some stage. Third condition is that, the Zikr of Allah Almighty should commence in his every body hair and the Zikr of Allah should pervade into his body, flesh and bones and the Zikr of 'Hu Hu' should be heard by him openly in both the Inward and the Outward. 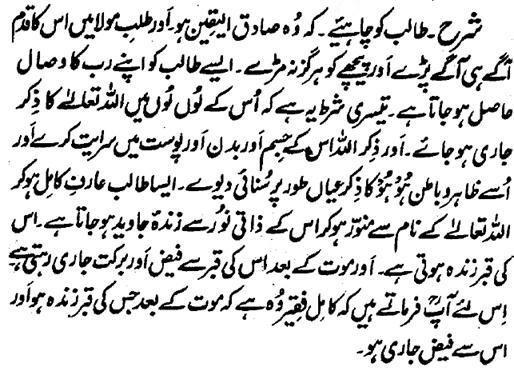 Such Seeker becomes the Kaamil Arif and turns the Living Forever through the Noor of the Essence of Allah Almighty after becoming illuminated by His Name. His grave is alive and the Beneficence and Auspiciousness (and blessing) remains in Current from his grave after his death. 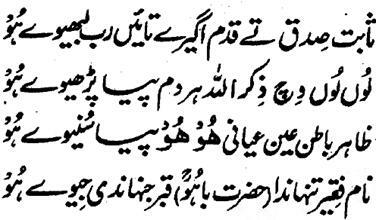 That is why, Hazrat Sultan Bahu Rahmatu-Allahe Ta-aala Alaihe says that the Kaamil Faqeer is he, whose grave is alive after his death and the Beneficence is being given by it.